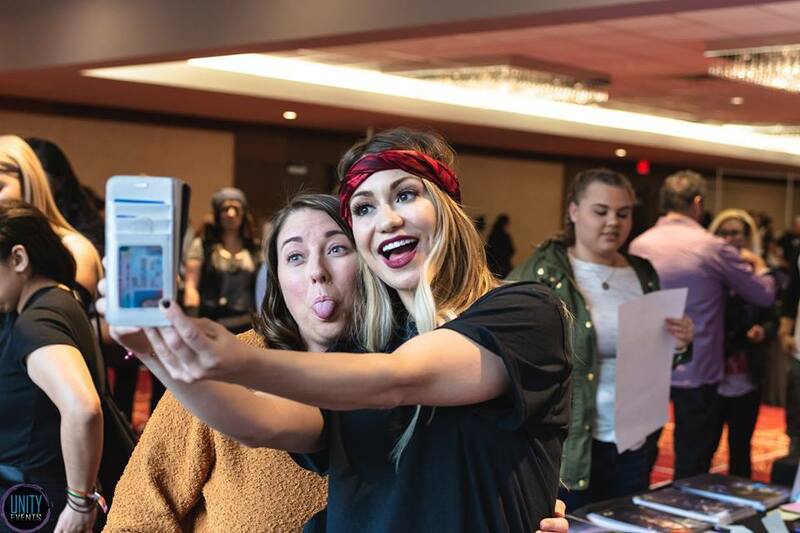 The third annual Unity Days fan convention in Vancouver, Canada brought out the best of The 100 fandom. All fans, whether of The 100 or something else, are drawn together by a love of something. 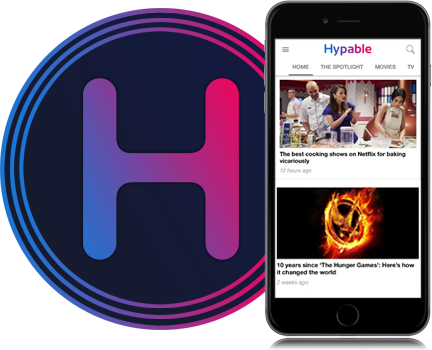 Within the past few decades, the internet has become a tool for fans to find each other and grow communities across geographical and social divides. In their shared online spaces, fans’ bonds become about so much more than the works that originally drew them together. We become friends, colleagues, partners; we find ourselves in groups of likeminded and like-hearted peers we couldn’t otherwise connect with. Yet, online, we also sometimes have a tendency to minimize each other’s humanity, seeing only tweets and likes and snippets of opinions that run counter to our own rather than whole, real people. Thus, online, fandom will sometimes be reduced to battling: battling for control of the narrative, for recognition, for the ‘truth,’ on increasingly public platforms where the stakes seem higher because the scope of influence on the cast and crew seems greater. Being a fan online can sometimes feel like an act of defiance in the face of everyone who opposes the thing you love, or even your way of loving it. Fandom is beautiful, but it can also be exhausting. But at its core, fandom is still about community, even when that community is fraught. It is defined by togetherness around one shared passion, founded on the love of a thing that connects us and expanded way beyond that thing. 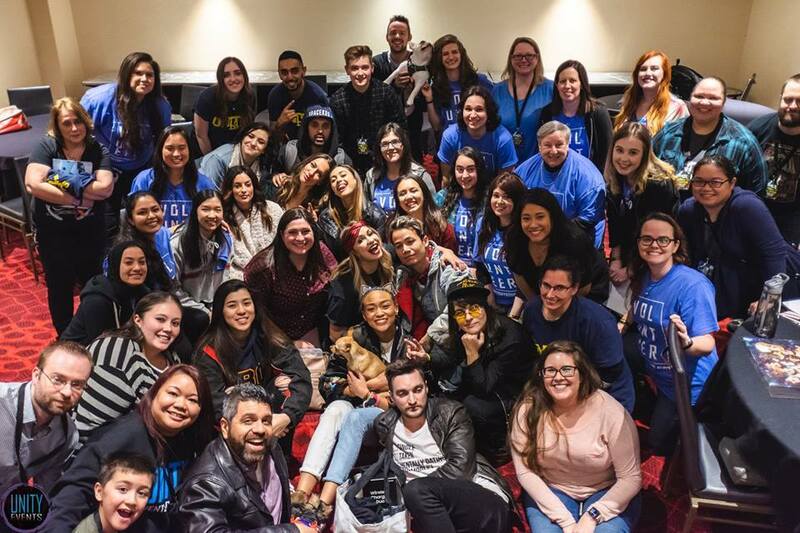 Enter Unity Days, the fan convention founded on the ethos of positivity and kindness by people who understand and participate in fandom. 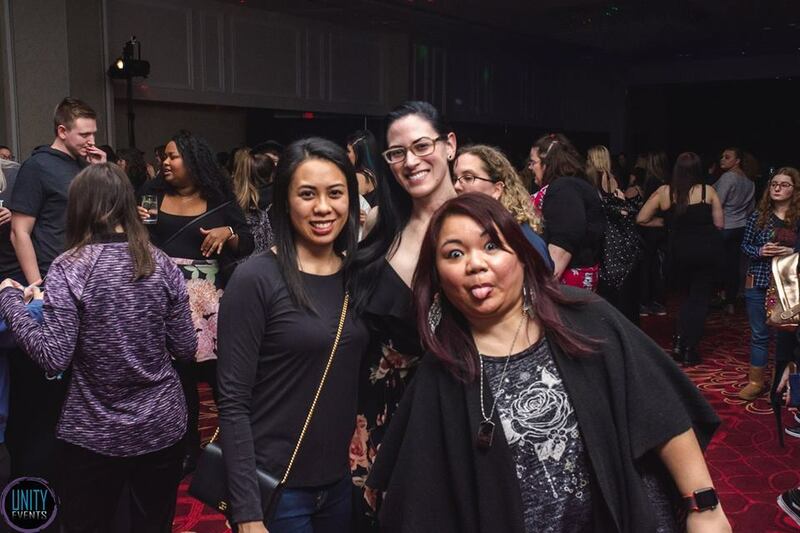 Set in The 100’s hometown of Vancouver, Canada, January 4-6 of the new year marked the third annual event organized by Leana Santos, Miah Bannerman, Linda Suurhoff, Shane Bannerman, Melissa Christensen, Colin Christensen and the rest of the Unity Events Canada team. I have made no secret of the fact that I didn’t always fully grasp the value of conventions. At their worst, fan conventions feel like transactions, and can be a very one-sided experience (for fans and talent alike). But what I have come to understand, particularly through attending two consecutive Unity Days events in Vancouver, is that a con experience is really an investment in the aforementioned love and passion, a commitment to the community, a way to make it a tangible, real, multi-layered thing. If you are a fan who chooses to go to a convention, to travel and spend money and time, you rarely do it for spite, and you rarely go in combative or close-minded. Above all else, Unity Days is an annual (🤞) party of likeminded nerds, many of who know each other online and/or from previous conventions by now. From year to year, first meetings between fans have been replaced by reunions. Standing in line for autographs or panels or photo-ops isn’t a necessary evil to get what you came for; it’s part of the experience, and just as rewarding. Repeat attendees can’t go anywhere without seeing someone they know, and (hopefully) sharing a wave or a hug or a smile, excited to be in the same space again, a little awed by the inherent weirdness of how and why we are all repeatedly brought together like this. First-time attendees hopefully feel welcome and included — that was, at least, the intention. We may not all agree on everything in The 100, but we nonetheless find common ground with each other in a way most probably don’t in ‘real life.’ We stay up too late and play games and rant and/or rave about fictional people and their fictional lives, of which we’re all equally invested. Nobody needs to be embarrassed by their weird hobby, because it isn’t weird here. Nobody needs to be anything they’re not. Some people cosplay, some don’t; some want pictures, some don’t; some get emotional when meeting their heroes, some don’t; it doesn’t matter. We’re all in this together. We all know we all care; nobody has to pretend not to. We are all fans, in one way or another, of fandom. Most of the cast and crew of The 100 are deeply cognisant of how significant the fans’ support for them and the show has been over the years, just as most of the convention-attending part of the fanbase understand that the cast share more with them and appreciate them more than could perhaps reasonably be expected. 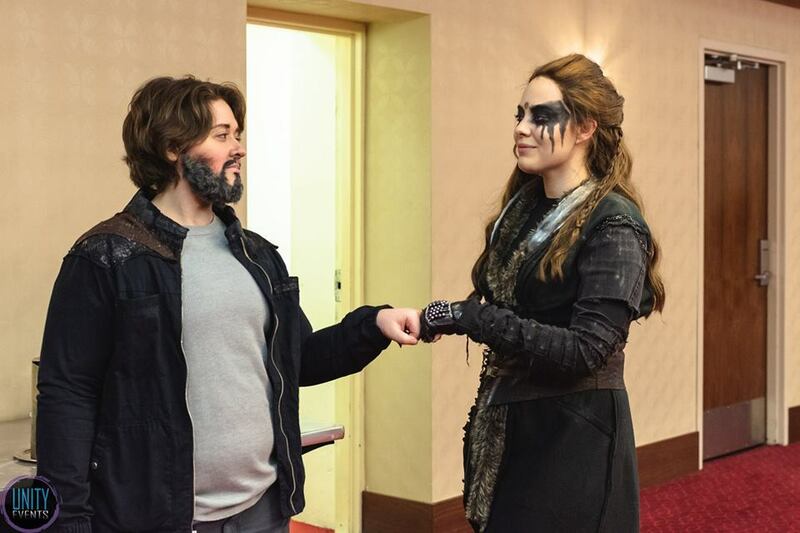 Their acceptance and appreciation of the fandom is in large part what makes an event like Unity Days possible, as the entire weekend is carefully structured to minimize the ‘talent’ and ‘fan’ divide, bridging the gaps and providing ample opportunity for informal togetherness. 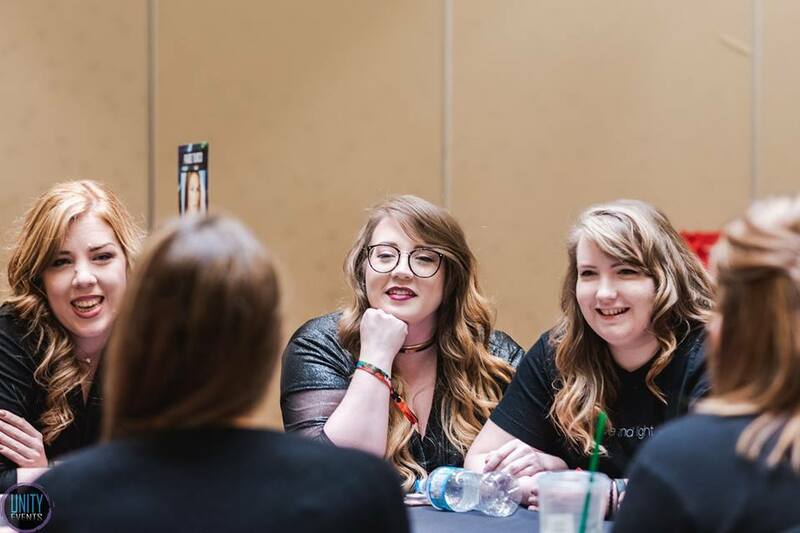 The focus is always on community and positivity, and the organizers work very hard to keep it that way, fostering a safe space for both fans and attending guests. There is a level of kinship — not unheard of, but certainly rare — between the creatives and fans of this particular show that shines so brightly at conventions, perhaps particularly Unity Days, and it is hard to explain to someone who has not experienced it. But I’m going to do my best to try. Aside from my own notes and tweets, I’ve included direct accounts from fellow attendees and members of presskru, because I could not possibly capture this event through my eyes alone. This year, I had the chance to step up my involvement with Unity Days, as I had been invited to co-moderate Saturday’s panels with TV Fanatic’s Yana Grebenyuk. I had moderated a few The 100 panels at other conventions, while Yana made her very brave and competent debut at this event. The support and kindness we received from both the audience and cast throughout the day was overwhelming. 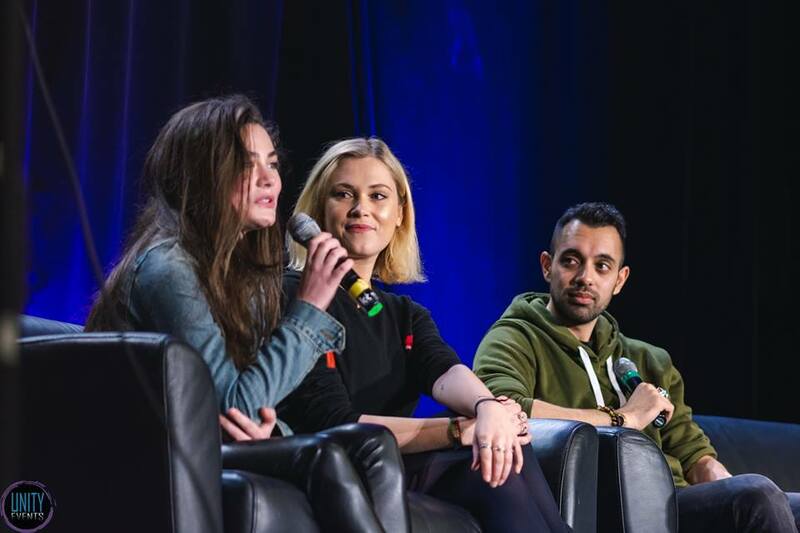 Attending talent on Saturday was Eliza Taylor, Lola Flanery, Sachin Sahel, Tasya Teles, Chelsey Reist, Tati Gabrielle, Erica Cerra, Jarod Joseph and new cast member Shannon Kook. 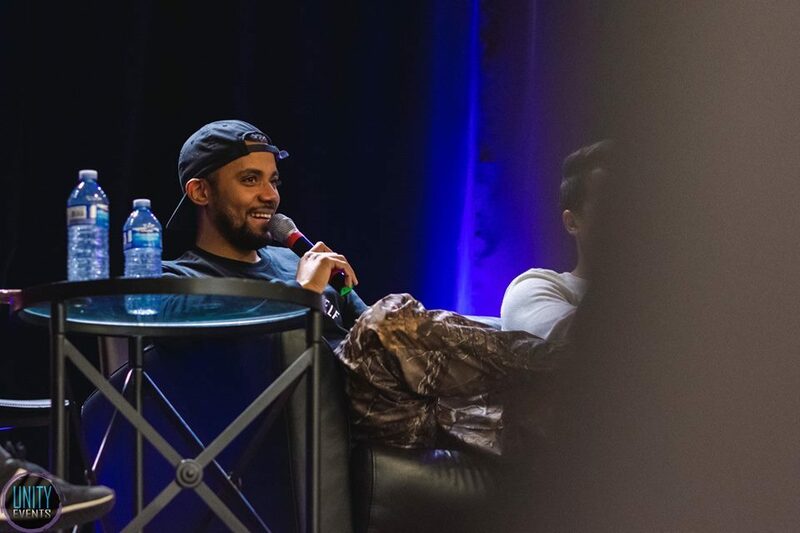 As per The 100 team’s tight-lipped policy regarding season 6 information, we wanted to focus our panels mainly on facilitating good conversation between the guests and making sure there was plenty of time for audience questions. 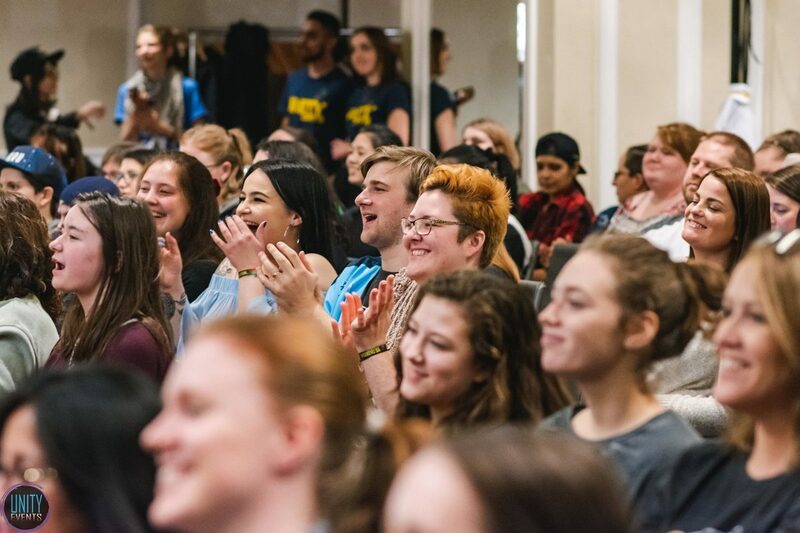 The cast all came in good spirits, and as usual went above and beyond to make the attendees feel the connection between actors and fans. 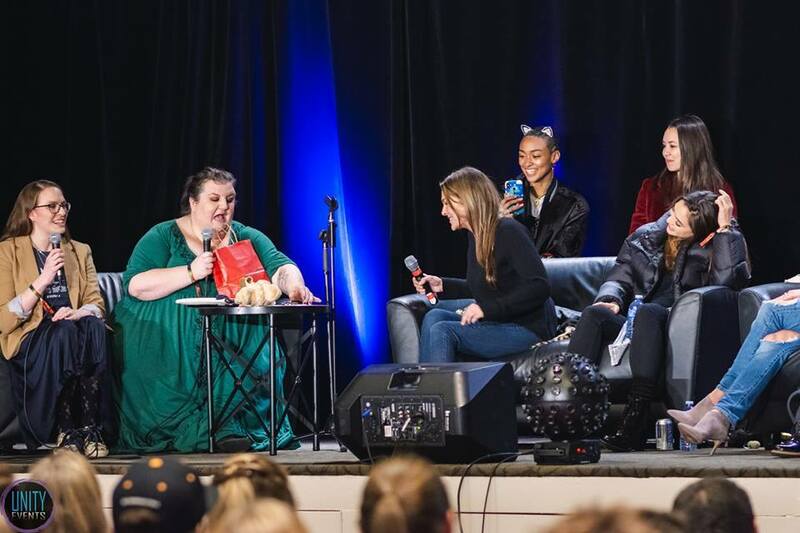 This was Lola Flanery’s first ever The 100 convention, but you wouldn’t have known that by looking at her; she came in like a pro to claim the title of reigning punheda from Sachin Sahel, and hilariously shared details of on-set shenanigans. Chelsey Reist and Shannon Kook (also a first-time con attendee) were on two panels together on Saturday, and took the opportunity to reflect a bit on the fact that Jordan is Harper’s son, as well as the uncanny resemblance between the two — as far as we know — unrelated actors. There was lots of joking around between the two, but also reflection on Reist’s part, as she had to say goodbye to Harper, a character she loved and identified with as a fellow empath. While saying goodbye to Harper was hard (and Reist may have wished she’d gone out in a badass way, like that time she was meant to puke herself to death), she appreciates having Jordan as Harper and Monty’s legacy. Kook certainly does his best to live up to the challenge of carrying Harper and Monty’s legacy forward. At the panel, we asked him how he managed to make Jordan somehow resemble Harper, Monty and his namesake Jasper, and he described “stalking” the actors on social media to get their mannerisms just right. At this point, he probably knows the show better than we do! Now that she is off the show (☹️) we also wanted to know if Reist could finally tell us Harper’s crime. Turns out it was never specified, but she said she had always imagined it being a crime of passion, with Harper killing a lover who wronged her. During the final panel of the day, we had not one but three surprise guest call-ins: Jessica Harmon, who had to cancel her appearance due to illness, Chris Larkin (“sorry Monty’s dead”) and Devon Bostick — in the closest he’s ever come to a UD appearance! On Saturday, Yana and I also participated in a reviewers’ panel, moderated by fellow The 100 reviewer Erin Brown. Here, we discussed the pros and cons of having screeners of episodes ahead of their release, as well as the value of many reviewers sharing many different opinions and interpretations of a show like The 100, which invites discussion and disagreement. Erin: Raven's disability was so refreshing bc she's so smart and beautiful but the choice to NOT take her pain away was a much more authentic experience bc there are ppl who also live with their own disabilities so it is an authenticity. Finally, we talked a bit about season 6 wishes, which included more open, honest discussions between the characters as in earlier episodes and the importance of staying true to the heart of the story. Sunday’s panels were moderated by the hosts of The 100 podcast Meta Station, Claire and Erin. The day’s panelists were Paige Turco, Lindsey Morgan, Chelsey Reist, Richard Harmon, Luisa d’Oliveira, Sachin Sahel, Tasya Teles, Tati Gabrielle, Erica Cerra and Shannon Kook. There was also a fantastic in-depth panel with #propkru’s Paxton Downard and Anthony Vani, who shared interesting behind-the-scenes details, such as the fact that most props are now 3D-printed, the cannibal cubes were imagined to have been made from grinding up entire human bodies (sorry for the visual), and the fried food Kane tried in Polis in season 3 was in fact the recurring radiation worms. Throughout the day, there was plenty of time for questions and incredible insight, most notably some very thoughtful comments by Paige Turco on Abby’s addiction storyline in season 6. Paige said that S5 was so dark; raw emotion, and trying to separate work and reality. Also, Paige didn't want to shock Lindsey. She also had a hard time detoxing and attacking Clarke. 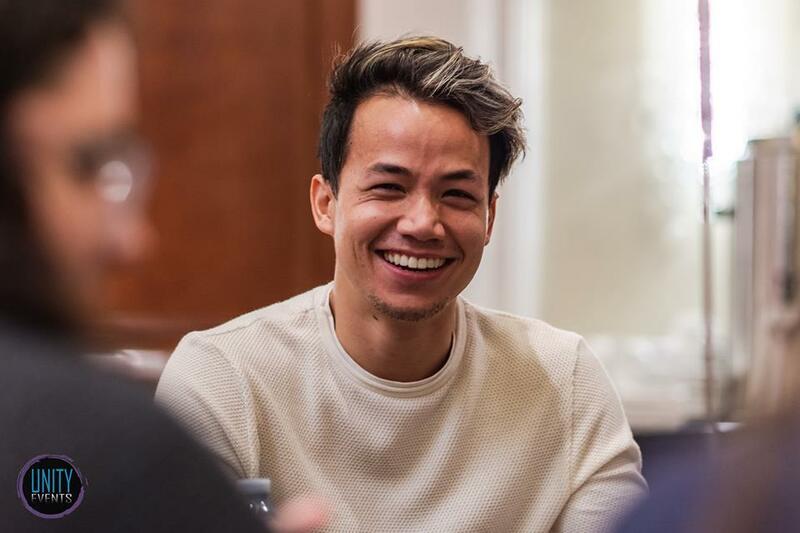 A number of the actors reflected on how they got their start in acting, with Shannon Kook, Erica Cerra and Tasya Teles all recalling how they started in other professions before finding the bravery to take the leap and pursue the career they really wanted. Tati Gabrielle, meanwhile, always knew she wanted to act and described using acting as a form of empowerment. Tasya Teles, Tati Gabrielle and Sachin Sahel took part in what was probably my personal favorite panel of the weekend, in which they gave some very thoughtful comments on how The 100 portrays nuanced and multi-faceted women and the need for increased visibility of minorities in the media. The Meta Station hosts, along with May We Geek Again host Jo, The Afictionados hosts Brittany Rae and Robyn Jeffrey and TellTale TV’s The 100 reviewer Samantha Coley participated in a ‘meta’ panel, on which they reflected on discussing the series and the significance of media discourse like what we all produce in the form of articles and podcasts. The panelists discussed how our podcasts, articles and debates about media serves as a window into larger conversations about human issues we feel more closely connected to. “When we’re having these conversations about TV characters, we are also talking about our real lives,” said Claire, with everyone on stage chiming in on how they deal with tackling issues on the show that represents their own personal experience. As Robyn pointed out, a podcast like The Afictionados is doing its own form of storytelling when taking a television show and broadening it into a deeper discussion. 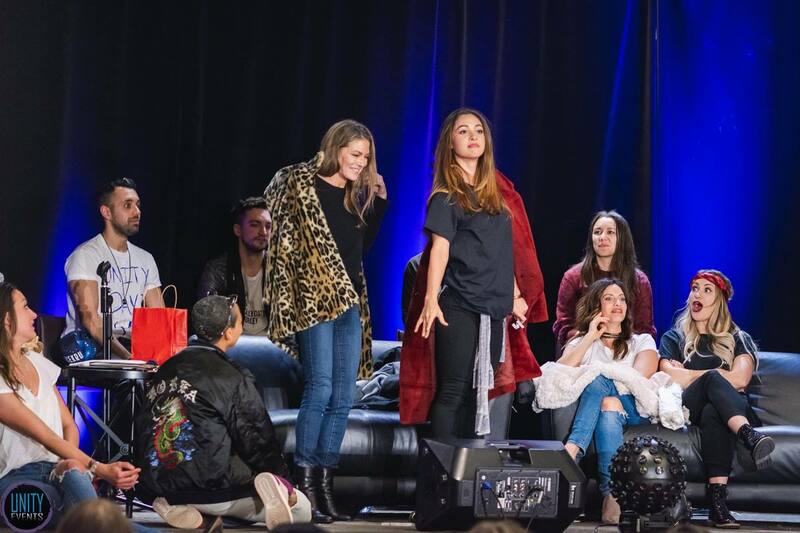 Finally, Sunday also introduced what is in my humble opinion one of the most ingenious things to grace a The 100 convention: Claire and Erin’s game, in which the cast had to say iconic lines from the show while portraying certain characters — from the show or otherwise. We had the pleasure of seeing Lindsey Morgan as Yoda, Shannon Kook as Gaia, Paige Turco as The Nanny, and Richard Harmon as Monty (assisted by Luisa d’Oliveira’s hair), and much more. It was hilarious, and a big part of making the weekend a fun, unique experience for both fans and actors. There was laughter, tears and crawling on the floor, and everyone wanted the amazing two-headed deer tiara. As mentioned, The 100 season 6 is a closed book (#2), and Unity Days 2019 was less about trying to get secrets out of the cast and more about celebrating the show and its fandom. But it wouldn’t be a fun hiatus if we didn’t have some crumbs to chew on, and the cast provided what they could. Here are the biggest things we learned, which aren’t big at all — certainly no bigger than a breadbox. 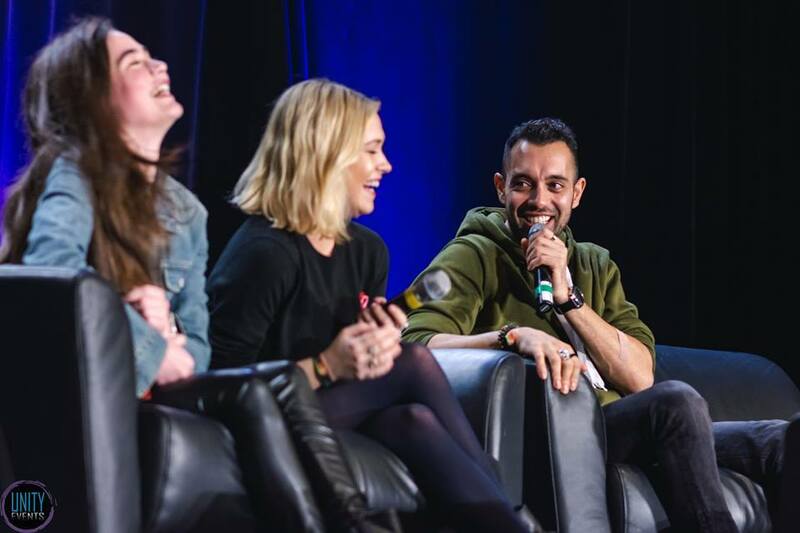 During the opening panel, Sachin Sahel and Eliza Taylor emphasized that season 6 of The 100, the so-called “Book 2,” is very different from anything we’ve seen so far. Before season 5, we heard a lot about how shocking and traumatic the season would be. This year, the vibe is undeniably different. There is a thrill and perhaps even a bit of nervousness about season 6, with the cast comparing it to the pilot, and everyone (including the props team) refusing to confirm a single piece of speculation. All of this secrecy is new for The 100 fandom, which is used to being teased and given material for speculation. We got a good chunk at the end of season 5 that we have to assume is still true, but that was also perhaps deceptively straightforward, at least if the cast and crew’s secrecy now and insistence that we will be shocked is any indication. As we learned at NYCC 2018, season 6 is the year we finally learn more about Echo and how she became the way she was when we first met her in season 2. On Saturday, we asked Tasya Teles how her expectations for Echo’s backstory lined up with what she’d been imagining for herself, and she said that while she had imagined something tragic, it wasn’t exactly like what we’ll learn in season 6. Although we should always be wary about expecting too much of anything before the episodes have been cut down to size, Eliza Taylor indicated that we can expect more of Eric Jackson in The 100 season 6, and she’s excited for fans to see that. Jackson has been a recurring character since season 1, inching his way into the spotlight season by season — a first name, a boyfriend, a crisis of conscience — and I personally think the more Jackson we get, the better. Shannon Kook was very careful about not revealing too much about his character Jordan Green, whose arrival at the end of season 5 sparked much excitement and discussion. Growing up with Monty and Harper on the ship, Jordan is naturally very inexperienced when it comes to dealing with people, and it was insinuated that he will get a little too excited and overwhelmed meeting new people on the ground. Kook also teased that Jordan’s relationship with the new planet will be interesting, which is good news since, really, he will essentially have the same experience the delinquents had in season 1 of arriving on the ground for the first time. In season 5, Miller had thrown his lot in with Octavia, becoming one of Blodreina’s staunchest supporters. In the final episodes, it was as important to him as to Octavia that Wonkru took the valley and proved all their hard choices had been worth it. 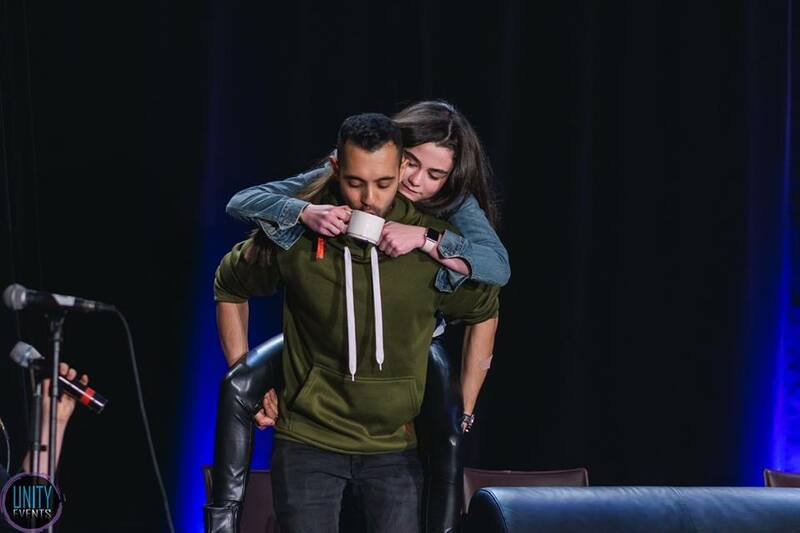 In season 6, Jarod Joseph says we’ll see Miller’s “hangover” from his time in Wonkru pretty quickly. The early premiere promo images revealed at NYCC show Miller as part of the first scouting mission on the ground, and sitting by a fire with Jackson, he appears very upset about something — potentially his time in the bunker. Joseph’s favorite scene for Miller is also coming up in The 100 season 6, and the episode he is most excited for people to see is the premiere. A few other season 6 snippets include the following tantalizingish tidbits: some characters will have big wardrobe changes and others (i.e. Bellamy) won’t; Joseph said he’d want to play Murphy this season, which perhaps indicates a meaty challenge for Richard Harmon; the episode Bob Morley is directing has a lot of Bellamy scenes; and there are, in fact, props. April 30 can’t come soon enough! For three years in a row, the organizers of Unity Days have worked harder than we can imagine trying to make a positive, warm and inclusive experience for a fandom that has desperately needed it. Of course we want more. We wanted more last year, after what was supposed to be the last Unity Days. And this year, Unity Days 3 ended with chants of “More, more UD4” led by the convention’s absolute biggest fan, Sachin Sahel. But Unity Events is branching out, launching straight into preparing their first Riverdale convention, SweetRiver Con. There are no current plans to do more The 100 events. I hope, of course, that the situation changes. I believe the UD team has figured out how to do conventions right, for the right reasons, and with the right values. Any fandom would be lucky to have a team that prizes fans’ happiness above all else. But if UD3 really was the end, then it was a hell of a high note to go out on, and the Unity Events team deserve nothing but our respect and support moving forward. I want to personally say thank you for being included and trusted as one of the weekend’s chosen moderators, and for the overwhelming spirit of positivity and respectfulness that shone from nearly every attendee. That said: more, more, UD4! All images by Devan Head.